William Morris is one of today’s great advocates for Mormon literature. Aside from founding and frequently contributing to the blog A Motley Vision, William is also a creative writer whose fiction addresses Mormon and non-Mormon subjects with depth, insight, and imagination. Recently, William published his first collection of Mormon stories, Dark Watch and Other Mormon-American Stories. 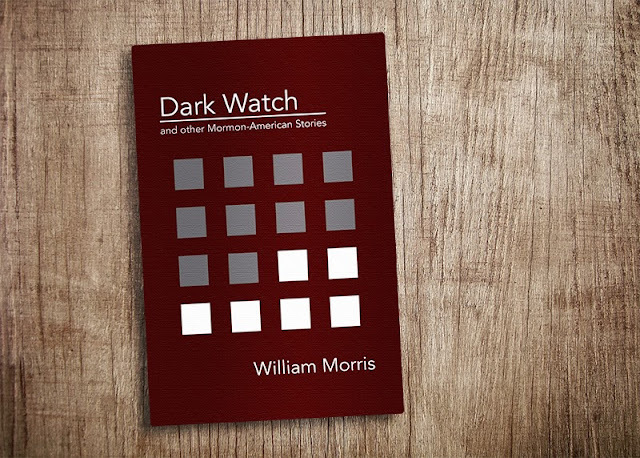 Tell us about Dark Watch and Other Mormon-American Stories. What's the genesis of the project? How long have you been working on this collection? And, as it turned out, in the process of putting the collection together, I found myself re-engaging with the issues and imagery and experiences that had caused me to write the stories in the first place, and so as much as I enjoy writing science fiction and fantasy aimed at the mainstream market and will continue to explore that part of my creative life, I'm actually not yet done with Mormon literature. I now look at it less as the end of my engagement with the field and more like the beginning of a new phase. It's interesting that you call your stories "Mormon-American." What does that term—or label—mean to you and your fiction? It's a joke and a wistful desire and a call to action. It's a joke because nobody uses the term Mormon-American, and it's highly debatable whether or not Mormonism was on its own for long enough to truly develop as an ethnicity. It's also a nod to Michael Austin's use of Mormo-American in his 1994 essay The Function of Mormon Literary Criticism at the Present Time, a usage which he meant slightly tongue-in-cheek. It's a wistful desire because there are times where I wish that Mormons who live in the United States and Canada identified more strongly as Mormons in a socio-cultural sense and embrace their Mormon-ness in ways that go beyond the basic of LDS Church activity even though I know that that's not really a reasonable (or possibly even desirable) expectation. And it's a call to action in that I part of me does think that thinking of oneself as a Mormon-American is useful and worthwhile for us as individuals and as a community. It underscores the fact that there's a core aspect of ourselves that is not whatever our national identity is (an increasingly important thing in an increasingly worldwide church); it creates some distance between our identities and the socio-political trends/groups of the idea; and it exhibits a sense of pride in our tradition as a people as well as our current communities and cultural production. The stories seem to follow a loose progression from the recent Mormon past (i.e. the late twentieth century) to the distant Mormon future. What common threads, if any, tie these Mormon experiences together? It's not a loose progression in terms of the timeline. The stories go in exact chronological order. That doesn't mean that they're all exactly in the same imagined world. For example, characters from one story don't carry over to another (with the exception of The Church Historian and Dark Watch) and some stories are more tied in with mimetic realism than others. What they all share (and this didn't become clear to me until I pulled the stories together into the collection) is a preoccupation with how Mormons experience their Mormon-ness, especially in situations where that Mormon-ness is constrained or awkward or difficult or buried. I was a little embarrassed once I had them all in one place to discover how predictable my fiction was. What story in the collection resonates most with you? Why? I believe I'm supposed to do that author cheating thing where I talk about how I love all the stories in different ways and then toss out three or four stories and what I like about each of them. But since I like to be honest in my dealings, I'll only cheat by rewording the question a bit. And it's true that all the stories resonate with different parts of me and my history. The story that resonated most across all levels of who I was when I wrote it is without a (shadow) of a doubt: "PAIH". It's not the best story in the collection. It's not great science fiction. It's kind of depressing if you look at the actual world building context for it. And it's certainly not me truly trying to prophecy the future. But there was something about the form of it, the characters and the way they communicate with each other that hit me hard when I was writing and revising it. And it still does when I think about it. It's also a story that best works within the context of the collection. It serves as one of two pivot points—the other being "Ride Home". What advice would you give Mormon writers today—particularly those who want to write about Mormon experiences? What would you say to those who don't see a point to writing about Mormons? The field is white, ready to harvest. The body of creative work by Mormons that is about Mormons is still fairly small, which means there is a lot of opportunity to stake out your section of the garden. But also because of that, I highly recommend doing some reading in the field so you aren't repeating the mistakes of your predecessors, which become glaringly apparent because there's so few precedents in comparison to other genres. You don't have to read everything (I haven't), and there are works that might take some searching out, but I do think too many folks want to write without having read. I'd also say that in order to write about the Mormon experience interesting, it helps to have Mormon experiences that are worth writing about. That doesn't mean that you have to have had a jet-setting life. Rather, it means to observe and think about your own life and the lives of those around you and engage with Mormon history and thought. As far as general advice for Mormon writers (whether they are engaged directly with Mormonism or not), I'd say that the best advice is to ignore most of the advice out there. Mormons tend to be really good at putting together a program of self-improvement and then implementing it. Which is fine, but doesn't always lead to the best creative work. So ignore what non-Mormons tell you you have to do or can't do and ignore what Mormons tell you you have to do or can't do. And whatever anyone tells you about how you have to do it. Write what you want, write as much or as little as you are able to (with no guilt and no undue anxiety), and write with fierce engagement with the worldview you have developed through your unique brand of Mormonism. And that's whether or not you directly address Mormonism or not in your work. I have nothing to say to those who don't see a point to writing about Mormons. They earn their reward. Scott Hales lives in a small house in a suburb of Cincinnati with his wife and three daughters. He spends a lot of his time reading Mormon fiction and trying to come up with original things to say about it. On weekday mornings, he gets up at 4:40 to teach seminary. On weekday evenings, he and his wife watch network television and wonder what it must be like to have a satellite dish and 400 channels. During the daytime, he is a graduate student in the Department of English and Comparative Literature at the University of Cincinnati. He doesn't like pets or home repairs. He always likes to watch superhero cartoons with his kids. Sometimes he rides a mountain bike in the woods behind his neighborhood. When he's feeling particularly nostalgic, he'll pull out his masterfully written mission journals and remember the days when he didn't sport sideburns. Twitter: @TheLowTechWorld. Blog: Artistic Preaching.